22 year old Sophie Bookey bought a punnet of raspberries from a Marks and Spencer store. When she went to wash them, a creature fell out. We went to wash them and this massive slug came out of the packet and into the sink. It was disgusting and I was just speechless. The slug was actually curled up inside the raspberry and somebody could easily have not seen it and put it into their mouth. It was horrible. After seeing the slug, she didn’t even want to look at the rest of the food she had bought from M&S. 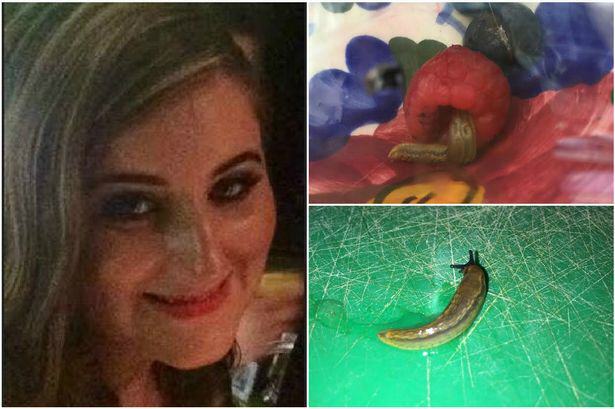 Sophie kept the slug alive, taking it back into the store in a bowl to show the managers exactly what she had brought home with her. We’re sorry to hear about the customer’s complaint. We pick and pack all our raspberries in our farmers’ fields so that they are fresh as possible and taste delicious. Whilst we take every step to ensure all insects and bugs are removed, on rare occasions they can get hidden in the packs. We do apologise for this and are always happy to offer the customer a full refund when the product is returned to our store. At least it was no ordinary slug, it was an M&S slug.